Traveling is one of my absolute favorite things in the world to do. Exploring new places, eating new foods and discovering new cultures are all things I live for. I am a massive planner, so I usually prepare to a T to make sure my adventures are fun and go smoothly. Once I reach my destination, I only want to soak in the experience; I don’t want to have to worry about anything. But, as much as you can plan, you can’t stop Mother Nature. I used to throw about 40 of the same size and style in my luggage if I was anticipating my period. Little did I know, this was actually hindering me from being my most comfortable! Did you know that you’re supposed to switch up the absorbency of your tampon throughout your cycle? At the start, try a regular tampon, switching to a super for your heaviest days. Your flow usually becomes lighter after the 2nd or 3rd day, so grab a lighter absorbency tampon for easier insertion/removal. 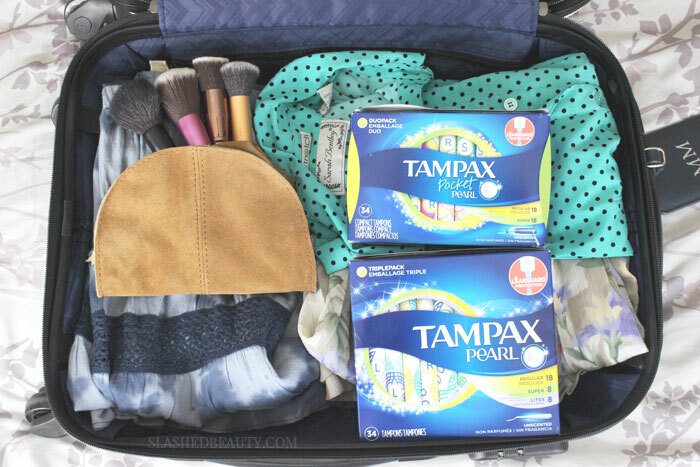 A Tampax Pearl TriplePack will have you covered. Expecting to be on-the-go a lot? Grab a DuoPack of Tampax Pocket Pearl that will slip into the smallest of stylish clutches. The Tampax Radiant are perfect for unexpected situations, since they have quiet and resealable wrappers if you care to be more discreet. Tampax Pearls are the only tampons I trust, since they have the LeakGuard Braid that helps stop leaks before they happen. So important on vacation! This one may sound weird, but hear me out— have you noticed that many hotels don’t line the trash cans? Hotel bathroom trash cans are also often lid-less. When you’re on your period, this presents a predicament! Bunch up a few plastic bags so that you can dispose feminine care products hygienically, and tie them up to mask odors. We all know the pain a period can bring. Be proactive and pack yourself a heating pad. If you don’t have an electric one, and aren’t sure if you’ll have access to a microwave, don’t fret. 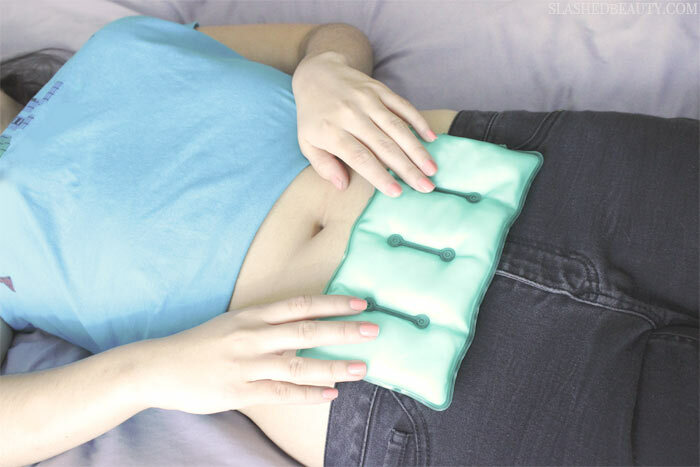 Pick up some disposable heat therapy patches that are aimed for back pain and place them on your lower abdomen. This will do the trick, plus they’re easy to pack and you can walk around with them on! Keep hygiene wipes with you while you’re out and about to keep feeling fresh throughout the day. You can’t imagine how much a difference this makes if you’re exploring a new city for hours on end. The Always Fresh & Clean Wipes-To-Go come individually wrapped so you can throw them in your bag to use at a moment’s notice. Cleanliness is key when you’re on your period. Keep hand sanitizer with you at all times so you’re prepared for any situation. Especially if you’ll be outdoors or limited to public restrooms, you don’t want to risk the chances of whether or not there will be a full soap dispenser available… if one at all! I know many of us get the lovely cherry on top— acne— during our time of month. 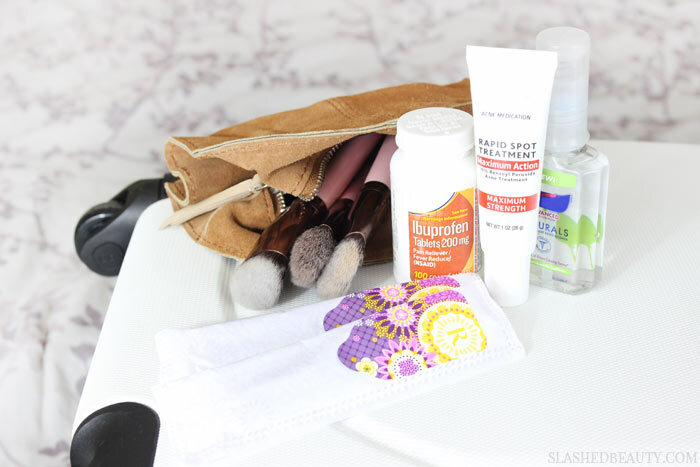 Pack a maximum strength spot treatment so you can stop zits in their tracks. The last thing you need is your skin giving you away in your vacation photos. Combine products that contain salicylic acid and benzoyl peroxide for fast results. A no brainer, but it would be such a bummer to forget them! Throw in a travel bottle of ibuprofen and keep them with you as you’re out and about. At the first sign of discomfort, pop the recommended dosage so you can avoid feeling crampy— and crabby— on vacation. 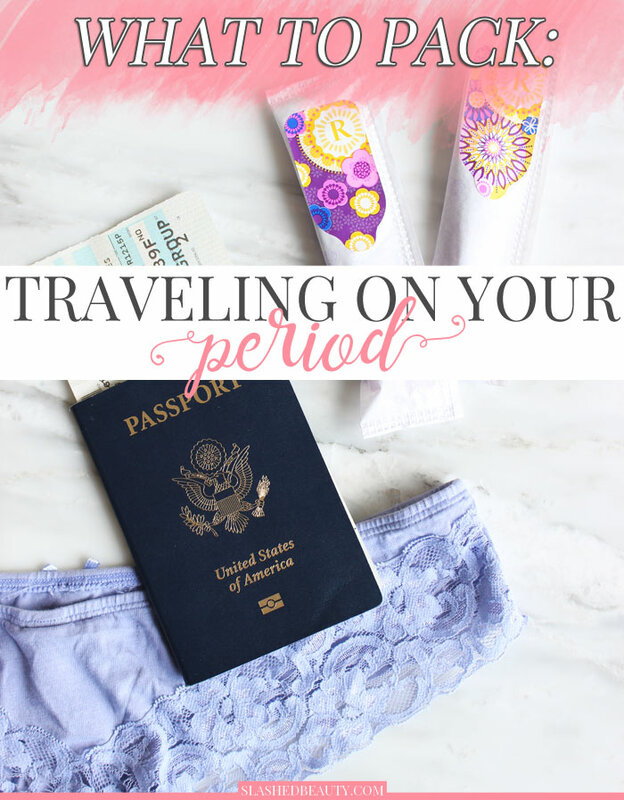 Do you have any other must-haves to bring while traveling on your period?